Joon-Ho Bong's Snowpiercer is a prime example of a major studio not knowing a good movie when they see it. With a limited release in the USA and no cinematic release to be seen in the UK so far, the film has steam-rolled the video-on-demand circuit. As it steadily gains some astonishing word of mouth, the movie looks like a dead-set to become one of the most underrated and under-seen cult films of the year. Gritty, brutal, yet very darkly comic, Snowpiercer is a charming piece of cinema that very impressively balances the camp and intensity of late '80s and early '90s science fiction to weave a genuinely engaging and interesting take on the post-apocalyptic narrative. With a powerful cast that boasts Chris Evans, Tilda Swinton and John Hurt, Snowpiercer breathes new life and energy into what is fast becoming an over-done and boring genre. With the film being set entirely on a train - the last remnant of a human society - the setting of the film doesn't limit its ambition. Instead of playing it safe, Snowpiercer is a genuinely unpredictable and intricate piece of cinema that blends a myriad of increasingly outlandish aesthetics into a perfectly realised '80s steam-punk sci-fi aesthetic. The first 20 minutes of Snowpiercer wrongly implies that it's just like any other post-apocalyptic narrative you've seen. What I mean by that is: everything is grey. The characters are grey. The train car is grey. The sky is grey. The food is grey. Of course, that's the point, the colours in these opening scenes evoke our characters' plight: a sense of hopelessness, of isolation, people without a signified personality or importance. The shots of this first train car are harsh. The lighting is slightly off, exposing all the blemishes and imperfections in the characters and the décor. With it's harshness comes the truth however and these characters are represented as genuine and without pretensions. Snowpiercer uses it's first 20 minutes to lure you into a false sense of security - its iconography is so basic that it's almost textbook. The camera lingers too long on chiselled, trench-coat wearing heroes who happen to have a wise old mentor - stock-characters that are so obviously a beacon of working class hope in a brutal, oppressive reality. However this pseudo-realism is all a façade, a bait-and-switch that makes it genuinely surprisingly when everything goes crazy and the film explodes into a bombastic, colourful, subverting adventure. 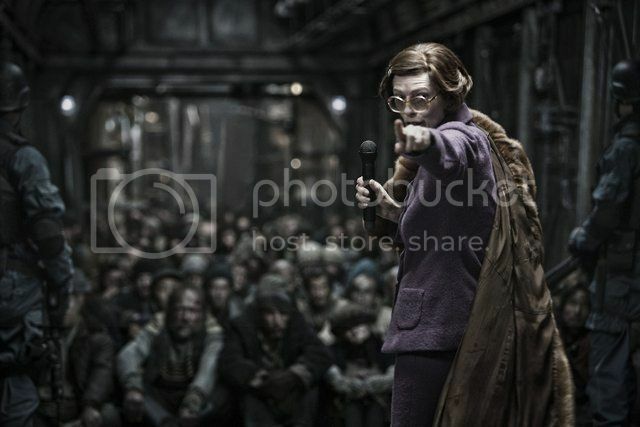 After a slow start, Snowpiercer becomes aggressively unpredictable, promptly introducing an absolutely insane Tilda Swinton in a ridiculous scenery-gobbling role. Evoking an evil British headmistress caricature, Swinton sports comically exaggerated false teeth and a ridiculous purple suit, an outfit nicely topped off with a fur coat. It's gloriously campy. The character is entirely out of place and it clashes with everything we've previously seen but it's the first warning as to where the movie's going. As the characters move through the train the inside of each car becomes increasingly strange and unfamiliar; you get the sense that anything could be hiding behind the next door. Will the next car hold a noisy club full of drugged up elites, or an eerie, silent hallway absolutely packed with terrifying masked men wielding axes and clubs? Snowpiercer becomes completely capricious with itss set-pieces and aesthetics, refusing to adopt a single tone or style. Our washed-out characters look at home in the first car, but by the time they hit the intensely bright and colourful classroom they appear awkward and out of place - silly even. It all works in Snowpiercer's favour though; by creating an extremely darkly comic atmosphere through it's cinematography the film feels constantly exciting and fresh. With the constantly changing aesthetic, Snowpiercer is allowed to experiment with numerous, often juxtaposing visual techniques. The action sequences for instance are filmed with an eloquent brutality. It's often uncomfortable to watch and the violence is dwelled upon - you're made to feel bad about enjoying what you're seeing. These sequences are particularly impressive because they successfully mix the quick and exciting brutality of hurried edits and shaky close-ups with more impressive slow-motion and point-of-view shots. Unlike something like Zack Snyder's 300, these techniques don't take you out of the experience - in fact you only notice they were there at all once the scene is over. This subtle sensibility extends to other visual affectations, particularly a great use of lighting. One sequence goes from full clear daylight to complete darkness, to the greenish tint of night vision, and finally to the explosive orange of fire. It's a magnificent way of playing around with the aesthetic to keep the scene exciting and surprisingly. The masterful thing about Snowpiercer is that it hides these subtle visual affectations in a ridiculously over-the-top and pulpy narrative. However, as aesthetically inventive as Snowpiercer is, it owes a great debt to science fiction of the '80s and '90s. Suitably, both narratively and visually, the film echoes the likes of Gilliam, combining both a superbly intellectual and subversive plot with a striking and complementary art style. 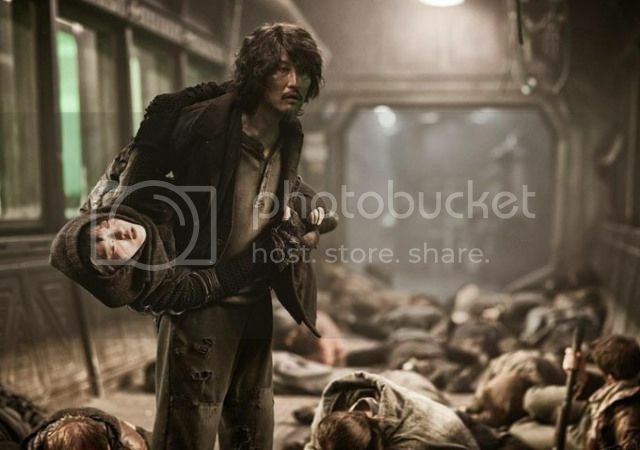 By looking at older films for inspiration, Snowpiercer manages to create a style decidedly modern by taking visual cues from both established classics as well as the best in modern science fiction. That's not to say it's unoriginal - the movie is just a glorious blend of old and new sensibilities, all wrapped in the distinct and occasionally kitsch personality of Joon-Ho Bong. The great thing about Snowpiercer's art style is that (beside some really dodgy CGI) the film feels timeless. The steam-punk aesthetic and the changing cinematic techniques means that the film wouldn't have looked out of pace 30 years ago, and it doesn't look out of place today. Snowpiercer's blend of Asian and American sensibilities doesn't always mesh perfectly, but even when it doesn't hit the mark it still makes for some thoroughly enjoyable and distinctly stylish film-making. If you're lucky enough to have it in a cinema near you then Snowpiercer isn't something you want to miss. At the very least it's a stylistic pulpy post-apocalyptic film that isn't shot entirely in washed-out grey, and, sadly, how common is that recently?